Snow, sleet, and ice is creating a slippery, slushy situation on local roadways, prompting some schools to cancel afternoon & evening classes and activities. Although the official first day of winter won't arrive until this upcoming weekend, Long Island has been feeling the season's wrath early, with numerous storms coating the Island in a blanket of snow. Currently, the National Weather Service has a Winter Weather Advisory in effect for both Nassau and Suffolk until 6 PM this evening, as well as a Hazardous Weather Outlook, which warns of 2 to 4 inches of snowfall which started off lighter this morning, but will continue to come down more steadily throughout the rest of the afternoon. Although the snow is supposed to taper off by this evening, it is possible that freezing rain or sleet. In Suffolk County, a handful of School Districts and private schools have cancelled their afternoon and evening activities and classes, in order to keep students and parents safe, and off the roads. With the Winter Weather Advisory in effect until at least 6 PM this evening, and the likelihood of continued precipitation and freezing temperatures, it is possible that other schools will follow suit - be sure to check our School Closures Directory frequently for updates on early dismissals, class cancellations, and closures for today and tomorrow. With snow and slush covering the roadways, town sand and salt trucks can be seen driving around and making roads safer for cars, although if the snow and sleet continues as predicted, hazardous driving conditions are bound to worsen. 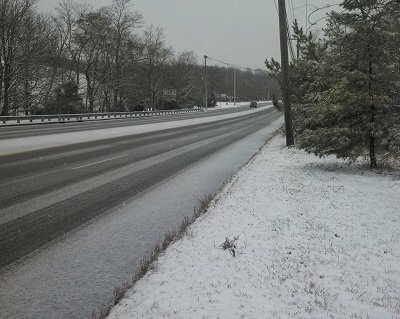 Before you head out this afternoon , be sure to get the latest weather update, and check out the LongIsland.com Traffic Center so that you can avoid any wintery messes on the road this evening. One question many locals are asking is whether or not we'll have a White Christmas here on Long Island - although it is still too early to tell, it is likely that higher temperatures later on this week will wipe out most of the remaining snow on the ground, but there's always a chance you'll be able to warm up by the fire and enjoy a picturesque winter wonderland this holiday. November Fun, Honoring LI Veterans, News & More in November 8th's Newsletter! Subject: LongIsland.com - Your Name sent you Article details of "Winter Weather Prompts LI Schools to Cancel Afternoon Classes & Activities"